Chamaecyparis obtusa (Japanese cypress, hinoki cypress or hinoki; Japanese: 檜 or 桧, hinoki) is a species of cypress native to central Japan. It is a slow-growing tree which grows to 35 m tall with a trunk up to 1 m in diameter. The bark is dark red-brown. The leaves are scale-like, 2–4 mm long, blunt tipped (obtuse), green above, and green below with a white stomatal band at the base of each scale-leaf. The cones are globose, 8–12 mm diameter, with 8–12 scales arranged in opposite pairs. 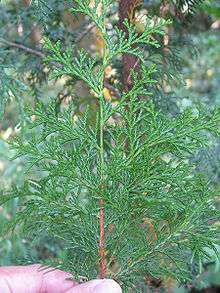 The related Chamaecyparis pisifera (sawara cypress) can be readily distinguished in its having pointed tips to the leaves and smaller cones. The plant is spread in Japan. A similar cypress found on Taiwan is treated by different botanists as either a variety of this species (as Chamaecyparis obtusa var. formosana) or as a separate species Chamaecyparis taiwanensis; it differs in having smaller cones (6–9 mm diameter) with smaller scales, and leaves with a more acute apex. For example, Horyuji Temple and Osaka Castle are built from hinoki wood. The hinoki grown in Kiso, used for building Ise Shrine, are called 御神木 go-shin-boku "divine tree". Hinoki (and sugi) pollen is a major cause of hay fever in Japan. Crippsii makes a broad conic golden-green crown with a vigorous leading shoot, growing to 15–20 m or more tall. Flabelliformis is a dwarf growing with pale green leaves. Kosteri is a dwarf with brilliant green foliage. Lycopodioides reaches up to 19 m tall, with somewhat fasciated foliage. Minima under 10 cm after 20 years with mid-green foliage. Nana Aurea has golden tips to the fans and a bronze tone in winter. Nana Gracilis has crowded fans of tiny branches producing richly textured effects; it is often cited as a dwarf but has reached 11 m tall in cultivation in Britain. Nana Lutea A compact, slow-growing, golden yellow selection which has become very popular. A yellow counterpart to 'Nana gracilis'. Spiralis is an erect, stiff dwarf tree. Tempelhof which grows to 2–4 metres has a green-yellow foliage that turns bronze in winter. Tetragona Aurea grows to around 18 m tall, with a narrow crown and irregular branching, the scale leaves in 4 equal ranks and branchlets tightly crowded, green and gold. The lignans chamaecypanones A and B, obtulignolide and isootobanone can be found in the heartwood of Chamaecyparis obtusa var. formosana. The biflavones sciadopitysin, ginkgetin, isoginkgetin, podocarpusflavone B, 7,7"-O-dimethylamentoflavone, bilobetin, podocarpusflavone A, 7-O-methylamentoflavone, amentoflavone and hinokiflavone have been confirmed in the leaves of the plant. ↑ Conifer Specialist Group (2000). "Chamaecyparis obtusa". IUCN Red List of Threatened Species. Version 2006. International Union for Conservation of Nature. Retrieved 11 May 2006. 1 2 3 Farjon, A. (2005). Monograph of Cupressaceae and Sciadopitys. Kew: Royal Botanic Gardens. ISBN 1-84246-068-4. 1 2 3 Rushforth, K. (1987). Conifers. Helm. ISBN 0-7470-2801-X. ↑ Kuo, Y.-H.; Chen, C.-H.; Chiang Y.-M. (September 2001). "Three novel and one new lignan, chamaecypanones A, B, obtulignolide and isootobanone from the heartwood of Chamaecyparis obtusa var. formosana". Tetrahedron Lett. 42 (38): 6731–6735. doi:10.1016/S0040-4039(01)01272-2. ↑ Krauze-Baranowska, M.; Pobłocka, L.; El-Hela, A. A. (September–October 2005). "Biflavones from Chamaecyparis obtusa". Z. Naturforsch. C. 60 (9–10): 679–685. PMID 16320608.